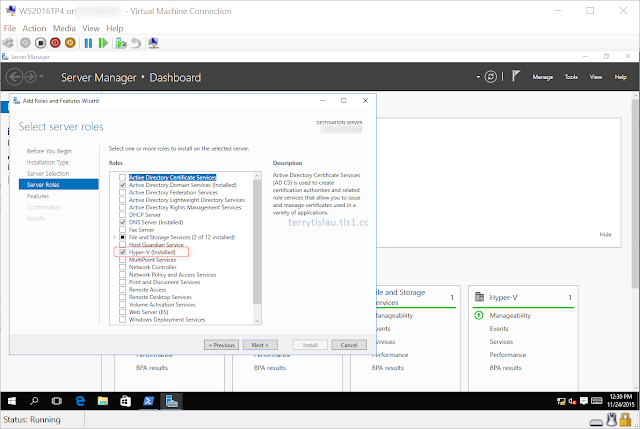 In Windows 10 build version 10586 and Windows Server 2016 Technical Preview 4, Microsoft added nested virtualization on Hyper-V. We can enable Hyper-V feature on a virtual machine which is installed Windows Server 2016 TP4 or Windows 10 build 10586. The build versions prior to Windows Server 2016 TP4 or Windows 10 build 10586. It doesn't work. At this moment, there are some limitations on a virtual machine which will be enabled Hyper-V feature. There are some requirements to use nested virtualization. or We can use a script which is provided by Microsoft to enable it. The script will configure a virtual machine to fulfill the requirements like disabling Mac address spoofing, changing the memory size and so on. Then, we can enable the Hyper-V feature on a VM. Please try to use it and give some feedback to Microsoft.